The Blue Ridge Parkway is the second most visited unit of the National Park Service with more than 1 million visitors annually, but that doesn’t mean that you can’t get off the beaten path to experience its stupendous views without standing behind a crowd. On a recent trip to Boone, NC, for example, I was surprised by just how much you could see—without seeing a lot of people. On the way to Grandfather Mountain, one of the more popular sites in the Southern Highlands region, which also includes attractions in Tennessee, Virginia and western North Carolina, we stopped to hike up the Rough Ridge Trail, which is located alongside the Blue Ridge Parkway (milepost 302.8). When we pulled into the parking lot, the first thing we saw was a small waterfall, running under a wooden bridge—a rather scenic view considering we hadn’t even gotten out of the car. It’s less than a mile to the summit of Rough Ridge, and it’s a nice hike, though admittedly, most of the first half of a mile is all uphill—you gain about 500 feet in elevation. 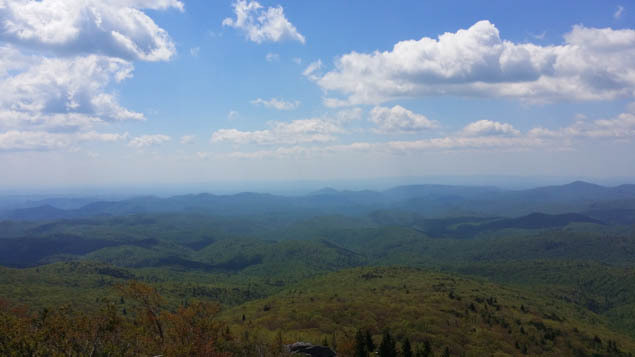 But I promise you that it’s worth it, because just as you get close to the top, you can walk out onto a massive rock overhang that provides a jaw-dropping view of the 5,000-foot drop from Grandfather Mountain to the flatlands. The hike ends in a boardwalk to the summit, where you can relax on benches and take in all of nature’s glory. While I’m not a big believer in the selfie, if you’re not taking one here, you’re missing a serious opportunity. This is only one of the trails in the Grandfather Mountain area, which boasts 50 hiking trails and 20 overlooks, ranging from fairly easy walks to far more strenuous sojourns. Some of the trails, like Rough Ridge, are located outside the official visitors’ center, so there’s no cost for their use; others are located at the top of Grandfather Mountain, so you will pay a fee that includes not only access to those trails, but also entrance to the Nature Museum and Restaurant, and a chance to check out otters, bears and more in the museum’s outdoor animal habitats. While you wander, you’ll be following in the footsteps of one of the area’s most famous visitors—Daniel Boone—who walked these forests in the 1760s, and for whom the town is named. You might also recognize the scenery from the movie, Forest Gump—there’s even a plaque designating the place where the character was filmed in his run across America. Speaking of adventures, you can test your own fortitude by crossing the Mile-High Swinging Bridge at the top of Grandfather Mountain, which is just as challenging as it sounds. The winds are fierce 5,280 feet above sea level, and I personally didn’t stop halfway across to take in the view as many people do—I chose to admire it once my feet were planted more firmly on terra firma. What’s surprising is that even though it seems a fairly inhospitable climate for plants, with wind gusts that can reach 95 mph, pinkshell azalea, which is native only to northwest North Carolina, still grows along the peaks. In fact, the world’s largest native population of the plant grows on the mountain, which has more plant diversity than is found in all of Europe. It is also home to numerous endangered species, including the Weller’s salamander and the Canada warbler. While it’s hard to imagine wanting to do anything other than enjoy the views, there are other attractions in the area, including the Tweetsie Railroad, the state’s first family theme park, and the Hickory Ridge Living History Museum. There are also unique place to shop, from the original Mast General Store, which is like taking a trip back in time, to the Parkway Craft Center at Flat Top Manor on the Moses Cone Estate, where you can not only look out over Bass Lake but find one-of-a-kind products made by local artisans. Stay social and follow us on Twitter!